In case you missed it, my beautiful daughter turned 2 this week! So of course we had a lovely little party for her over the weekend. And I have to say the whole event was relatively stress free. Don’t have the party at your house. Possum’s first birthday was at our house. This meant the house had to be clean. Need I say more. This year we went to the park, literally around the corner from our house. It has kick arse swings, two slides, toilets and under cover picnic areas. Perfect. There was plenty of room for happy toddlers to run around, grass for younger bubs to roll around on and plenty of breathing room for this pregnant mumma. Delegate, delegate, delegate. Repeat after me. “I don’t have to do everything, I don’t have to do everything”. This is what friends and family are for. Grandparents are wonderful in so many ways. Their amazing cooking, cleaning and entertaining skills can all be put to good use when planning a party. For example my mother in law cleaned up the undercover picnic areas for us the morning of the party. Amazing. My parents came to our house to help do morning dishes, entertain Possum and my Mum was wonderful and whipped up some cream cheese icing at the last minute for Possum’s birthday cake. My sister loves shiny pretty things and is wonderfully creative. So her job was decorations. I literally said “balloons and streamers in rainbow colours”. I arrived to find home made paper chains, balloons, streamers, glittery shapes and a happy birthday banner. Way more than my brain could even compute! Keep things simple. Toddlers are wonderful little creatures and get crazy excited at even the littlest of things. Like having party hats and a cake. They don’t need a live band, 20 animal petting zoo AND a decorator cake. The little ones had so much fun dancing around the park with streamers, hiding in bushes and watching balloons make farting noises as they zoomed through the air. Nice and simple. Get someone else to take photos. Kind of like your wedding day, you want to enjoy the fact you have kept a tiny little person alive for so long despite horrible sleep, a diet of food scraps and cold tea and a complete and utter sense of having no idea what the hell you are doing. Celebrate! But do get someone else to capture your happy faces. Make sure that person understands your camera and are happy to be the camera person for the day. Reassure them you don’t want Ansel Adams images, just your typical family happy snaps. Skip the presents. I don’t mean all together, but just from party guests. I think Possum’s Grandparents would have a meltdown if we said no gifts from them! Ask guests to bring a plate of food to share instead. This is a double win. Your party gets catered plus you don’t have to deal with bringing even more stuff into your home. Also, many kids/adults have food allergies and sensitivities. Bring a plate allows families to bring known safe food. It also saves you having to make gluten free, dairy free, nut free, egg free anything. Have a plan. It’s a good idea to have at least a vague idea of what you need/want for this party. To make this easier for you I have made a free party planner printable. Stick it on the fridge (next to your free printable meal planner!) and add to it as you think of things. Click Pea Fritters Party Planner Free Printable to download. I truly hope you have a wonderful day celebrating your little person! 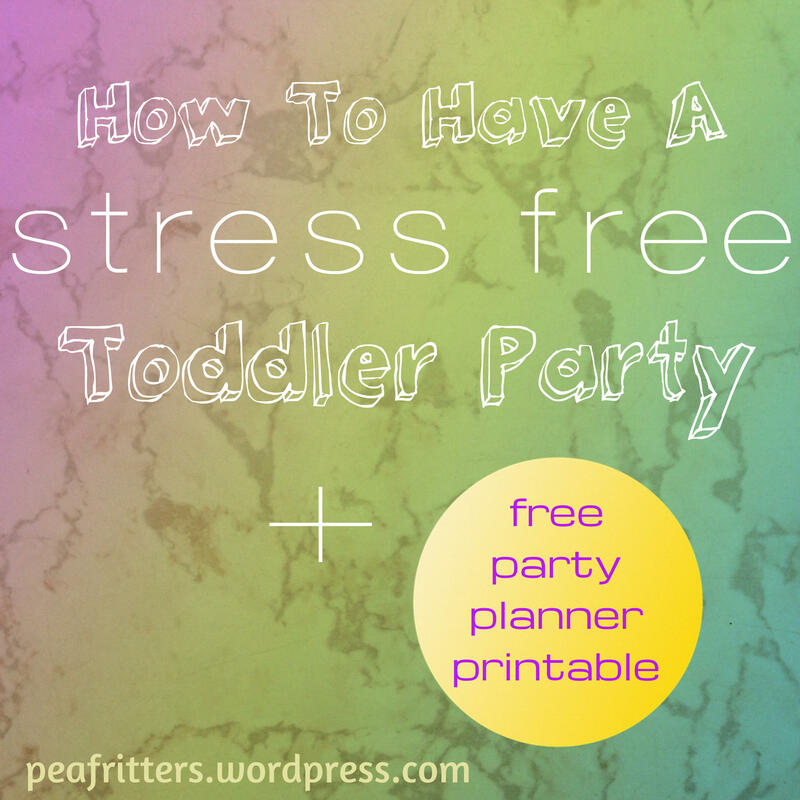 Have a friend who you think might find this post and free party planner printable helpful? Simply share this post on Facebook, Pinterest or email! ***Want to be kept up to date with all new Pea Fritters posts? Follow on WordPress or sign up with your email to receive posts straight to your inbox! I know our daughter gets overwhelmed with too many gifts so that was a big motivator too. How old are your kidlets? Hi! Im Ruth. This is my story of trying to feed my family, with allergies, week by week. Thank goodness for Baby Led Weaning and Meal Planning! Seriously good cakes free from gluten, dairy, egg and nuts. Ramblings of a student, a mummy to miracle baby George, cancer survivor and self-confessed makeup addict.... Proud follower of the "Make-It-Up-As-You-Go" style of parenting.